Just one cyclocross race for Gosse this weekend. 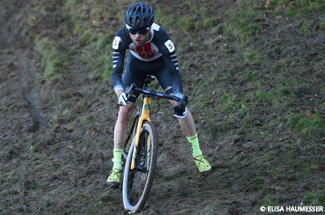 Gosse started in the Radcross Grandprix Bensheim after one week of almost complete rest. After a busy period with a lot of races and travelling Gosse took some rest during the past week. “The body felt tired after all those hard races and travelling. Last week it was all about getting as much rest as possible”, Gosse told. In Radcross Grandprix Bensheim Gosse was off with a decent start. After the first lap he crossed the line 11th, but his opponents for a top-10 position weren`t far away. In the next laps Gosse got into a good rhythm and moved up as the races progressed. After 1 hour of hard racing Gosse crossed the line 7th. “The first two laps didn`t went easy, but after that I got a good feeling and moved up in the top-10. Finishing 7th is a good way to start the month December for me, especially after one week of complete rest”, Gosse commented after the race.